Navigation: Home » Personal Finance » What Was Your Savings Rate in 2015? In this article, we continue our annual tradition of sharing our savings rate. We consider a savings rate to be one of the most important numbers you can optimize when it comes to your personal finances – all the strategies you put into play are easier with a higher rate, and you have more room for error. Every dollar you don’t spend is not only coming off the expenses side – it’s also sticking around to help you grow your net worth at a faster pace! Along those lines, we’ve also noted that with a calculation of net worth and a savings rate alone (and a reasonable return estimate) you can guess how long it’ll be before you’re financially independent. We’ve also created a calculator for you to try to match our savings rate calculation. Our net savings rate in 2015 was 34.23%. That is slightly down from our net rate of 37.26% in 2014. For comparison to your own rate, we’re married 30-something homeowners in the Bay Area with a daughter and another baby on the way… and a very loyal dog! 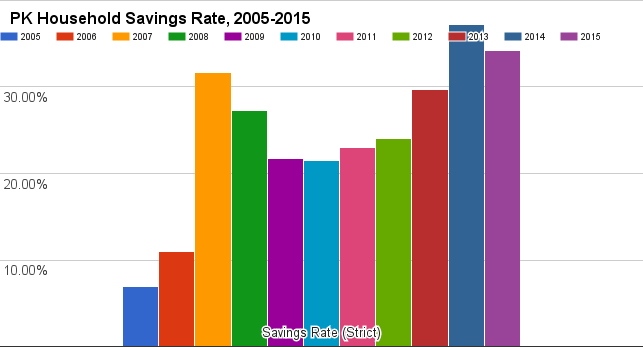 We’ve been tracking our net savings rate closely the last 11 years. We’re pessimistic on our rate this year – we expect it to dip a bit due to the expenses of our second, but hopefully we’ll keep it over 30%. I do think 30% is a solid savings rate target. That’s especially true for net savings rates which are way stricter than gross savings rates quoted elsewhere (and yes, I know that a dollar paid down on a loan is still a dollar towards net worth). We’ve charted out the effect of savings rates on your years to financial independence before, and estimated that even 10% savings rates should keep you on track for retirement in a 40-year career assuming normal investment conditions (who knows?). Ostensibly, this is a personal finance site. That means that topics that Cameron and I cover are tangentially related to one of our interests, whether that means we disagree with the practice, are neutral on it, or embrace it. We’re only going to write on things that hold our interest long enough to write 500+ words. That’s why the few inward looking articles we do a year are important. It signals to you whether we’re following our own advice and “practicing what we preach”. On a personal level, it also keeps my wife and I on target. I’d expect you to discard everything written here if we suddenly became chronic overspenders! So, stay tuned for some of our other ‘personal’ personal finance articles – normally we like to share our investment breakdown versus benchmarks along with our active/passive breakdown. As usual, there’s no ETA on those pieces – expect the normal levels of randomness from DQYDJ in the meantime! How was your savings rate in 2015? Do you prefer gross or net savings rates? Since it’s probably gross, how much do you hate that we still quote net rates? I saved quite a bit in 2015 but am eating all of it in 2016. Soon, I will be dropping my net worth down even lower and have to rebuild it all over again as it’ll end up in a fixed asset (house).. and I’ll just cover the investments as my net worth. Well, there’s more than one way to increase net worth – here’s to crossing my fingers on your house working out! It’s a stressful time, but you’ll enjoy it a lot more once all is said and done. Glad to see 2015 savings rates posted! I find the net vs gross breakdowns interesting so I hope you\’ll keep that going forward. In 2015 our income was considerably higher so our savings percentages (39% net and 43% gross) are a bit lower than the previous year. This year I expect that our savings rate will be negative due to high medical bills so we\’re glad to have cash saved from previous years! Well, hopefully it doesn’t look that bad (I’m in California! ), but we came in at the mid 40%s again, probably a bit less than last year. I don’t have an exact number – maybe I’ll get into the weeds and try to back calculate it for all 11 (12) next year. Hmmmm… Seems like I have not thought as deeply about rules for savings rate as you have (I guess that’s a safe bet for most topics, tho!). I do understand the rationale behind your rules, and it seems as long as you’re consistent and don’t evaluate savings rate in isolation almost any approach is fine. But I do find interesting the firm line you draw between accounts (of all types) and home equity. It feels like it’s more a continuum – bank accounts or taxable brokerage would be at one end with home equity at another. Tax-advantaged accounts start to have some of the drawbacks (e.g., not as easy to liquidate / access) as home equity, but they do count to savings in the PK world. I’ve always taken a two step approach – what do I save from wage income (my savings rate), and then what do I do with it. As long as I’m not in a liquidity crisis, it’s savings – whether it goes in my mattress or pays down equity. If I understand the PK way, buying a rental property, or a business, or a golden goose, all would reduce your savings rate. They’d hopefully increase it in the future as they produce income, but they’d look the same as just spending money in the given year, correct? In any event, consistent rules seem to be the key (but pls. revisit if you do buy a golden goose, or in a pinch I’ll be happy to make a market for you). Yea, it does feel like a bit of an anachronism (don’t trust the edit date on the argument piece, it’s from the site move) – my point was to separate actual ‘I chose to save this’ saving from the so-called ‘forced saving’ you get when paying down any form of debt. I do recognize, say, the difference between real estate (historically matching inflation… if not matching the Bay Area’s returns) and, say, cars and personal loans but paying a fixed note to a bank isn’t as pure as choosing to divert otherwise spendable money into an account. So, yes, rental income is income but rental mortgages are ‘forced savings’ and not ‘pure savings’ in my ham-handed method. Even though real estate certainly blurs the line (along with fine art or true collectibles or anything that appreciates or holds value), ‘pure savings’ also could turn into ‘pure spending’ tomorrow – it’s the fixed payments that need to somehow be found. And you’re right, other accounts have issues too, much like home/property equity – 401(k)s need loans, IRAs need 72(t)s for a while (I’m only in my 30s)… but outside of that, money can be mine within a week. And, don’t worry, when I track our net worth I don’t throw out our real estate equity! I’m also in the bay area. At present I’m saving about 30% (retirement) which is the highest I’ve ever done but going back to 95 I started with 15% working my way up after 2006. Just this year after some calculations I realized that the 800k in ira’s and 250 in retail gets me to financial independence, though a kind of thin version. I’m leaving my work after 19 years next year. Taking some time off then doing part time after that. Perhaps if your around we can have coffee.